If you forgot to live out all your Optimus Prime role-playing fantasies when the first Transformers movie came out, fear not. 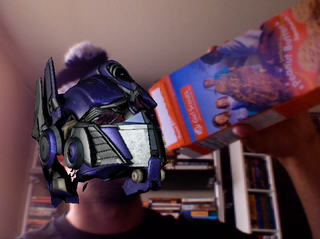 Thanks to the awesome Satan powers of augmented reality, you can wear the face of Optimus Prime anywhere. So here's how this works: the Active X applet hijacks your webcam and uses face/eye detection to figure out where to plaster Prime's face. Once it figures that out, it renders a 3D head around your own mug, allowing you live vicariously through the leader of the autobots. But if you get too zealous in trying to save the world, the helmet will disappear—vigorous head movement angers the Autobot gods, and they will steal the head of Prime from you (along with the Matrix of Leadership).